SACRAMENTO, California, February 6, 2013 (ENS) – UPS is buying 100 electric commercial vehicles made in California and putting them to work delivering packages around the state, the company announced Tuesday. At the same time, California Governor Jerry Brown released a Zero Emission Vehicle Action Plan, the most comprehensive effort by a state to accelerate the deployment of plug-in electric vehicles. The state Office of Planning and Research released the Zero Emission Vehicle Action Plan to implement Governor Brown’s March 2012 Executive Order to put 1.5 million zero emission vehicles on California’s roads by 2025. ZEVs under the executive order and action plan include hydrogen fuel cell electric vehicles, battery electric vehicles and plug-in hybrids. The Action Plan details concrete actions that state agencies are taking to help accelerate the market for plug-in electric vehicles and fuel cell electric vehicles. The plan supports the California Air Resources Board’s Advanced Clean Car regulations which will greatly reduce greenhouse gas emissions in the state. Transportation is California’s largest source of greenhouse gas emissions. The Advanced Clean Car regulations are part of the suite of greenhouse gas emission reduction programs developed under the California Global Warming Solutions Act (AB 32) and approved by the Air Resources Board to reduce those emissions to 1990 levels. Other AB 32 programs include the Low Carbon Fuel Standard, Renewables Portfolio Standard and a cap-and-trade system for carbon dioxide. Click here to read Governor Brown’s Zero Emission Vehicle Action Plan. 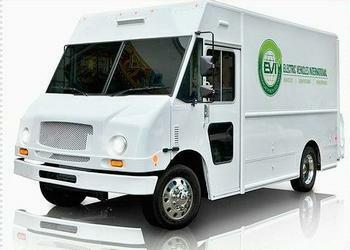 The 100 electric walk-in vans that UPS is buying were manufactured in Stockton, California by Electric Vehicles International (EVI). The purchase of these vehicles from EVI is providing new jobs and revenue to the state, as well as creating vehicles that will improve air quality. These UPS electric trucks will reduce the consumption of conventional motor fuel by approximately 126,000 gallons per year, said UPS. Additional benefits include reduction of carbon emissions and noise. The vehicles have a range of up to 75 miles and will deliver packages to customers in Sacramento, San Bernardino, Ceres, Fresno and Bakersfield. “We currently operate more than 2,500 alternative fuel vehicles worldwide with a variety of hybrid, electric and natural gas technologies, making UPS the leader in logistics sustainability,” said Myron Gray, president of U.S. operations for UPS. The partners responsible for making this project a success include the Governor’s Office of Business and Economic Development, California Air Resources Board, California Energy Commission, South Coast Air Quality Management District, San Joaquin Air Pollution Control District, Sacramento Air Quality Management District and the U.S. Environmental Protection Agency. Air Resources Board Chairman Mary Nichols said helping to fund UPS for the purchase of these 100 electric vans is good for the state. California’s share of the U.S. market for plug-in electric vehicles currently stands at nearly 40 percent and automakers are planning to launch fuel cell electric vehicles in California beginning in 2015.